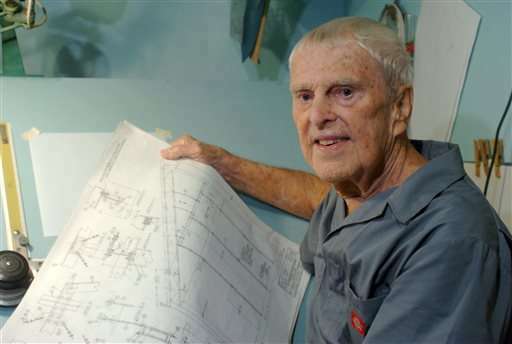 The last known surviving member of the German engineering team that came to the United States after World War II and designed the rocket that took astronauts to the moon has died. Oscar Carl Holderer died Tuesday in Alabama, son Michael Holderer said Wednesday. He was 95. Holderer said his father suffered a stroke last week and did not recover. Born in Germany the year after World War I ended, Holderer came to the United States in 1945 with a group of 120 rocket engineers led by Wernher von Braun. Their move was part of a project called "Operation Paperclip" that transferred technology for the German V-2 and other rockets to the United States. "He brought our first rocket wind tunnel in this country from Germany and personally set it up," said Ed Buckbee, a space historian and former NASA publicist. First based at White Sands, New Mexico, the team moved in 1950 to north Alabama's Redstone Arsenal, where they used early computers, slide rules and pencils to design the Saturn V rocket that first took astronauts to the lunar surface in 1969. Holderer said his father—a mechanical engineer, designer and fabricator who became a U.S. citizen in 1955—designed the high-speed wind tunnel that was used to develop Saturn and then oversaw its construction at NASA's Marshall Space Flight Center, located at Redstone. "He was one of the more hands-on members of the team," said Holderer. "He had his own machine shop here in town as a hobby." Some members of the von Braun team eventually returned to Germany and others spread out across the United States after retirement, but Holderer was the last known survivor of the original group, Buckbee said. "He was a very talented man, not only an aeroballistics expert but very accomplished in design and fabrication," said Buckbee. While von Braun and some high-level members of his team faced questions about alleged Nazi ties, Holderer didn't. "He was just never at that level of supervision," Buckbee said. Following his retirement from NASA in 1974, Holderer built training devices that are still in use at the state-run U.S. Space and Rocket Center, located near NASA's Marshall Space Flight Center in Huntsville. Working in his shop, Holderer converted the tail section of a jetliner into a small theater for the space museum. "They would tilt it back to simulate acceleration," said Holderer. Survivors include his wife, two sons and two stepchildren. The family will hold a visitation Friday, followed by private interment.